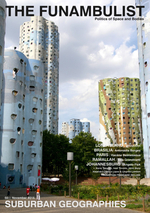 THE FUNAMBULIST is a bimestrial printed and digital magazine complemented with a blog and a podcast (Archipelago) edited by Léopold Lambert. Its subtitle, “Politics of Space and Bodies,” expresses it ambition to bridge the world of design (architecture, urbanism, industrial and fashion design) with the world of the humanities (philosophy, anthropology, history, geography, etc.) through critical articles written by long-time collaborators as well as new ones.